Frogs are seen in all the regions except in Arctic and Antarctica regions. There are more than 5000 varieties of frogs from 33 families. Few frogs live near to the water and few other live far from water. Frogs can see the things around them without moving their eyeball as their eyes are bulged out. The females lay the eggs in the water and they hatch in 3 to 25 days. In the beginning, frogs will have the tail and they are called as tadpoles. Later on they emerge as complete frog. They are seen in many colors like light brown, green, blue etc. These colors will be helpful while protecting themselves from enemies and few frogs have poison also. Living things die when the poisonous frog just touches them. Frogs will eat prawns, insects, spiders and earth worms as food. Some frogs which are big in size will eat small squirrels, rats and other amphibians. Male frogs will shout in the nights to attract the female frogs during the rainy season. Frogs are getting reduced due to many reasons. Few reasons are increase in population, reduction of water sources and industrialization. Few frog varieties are extinct and few others are in the extinct stages. 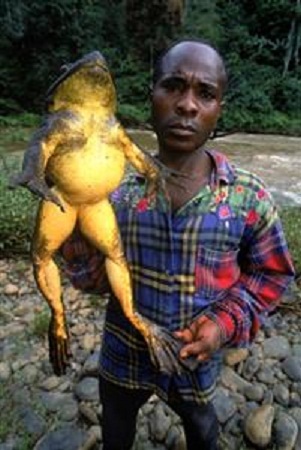 Goliath frogs are biggest frogs in size and they are 13.5 inches in length. They weigh 3 kilos and the lifespan of the frog is 1 to 30 years. This type of frog is seen in Africa forests. Golden frog which belongs to Brazil is the smallest frog and it is one cm in length. The frogs which live Australia are special and they grow 50% weight in rainy season. These frogs can live in water for two years without coming out of the water and frogs are very helpful in research programs. They are playing vital roles in HIV and cancer research.